Escaping Emotional Entrapment: Freedom From Negative Thinking and Unhealthy Emotions - Daniel Rutley - Break those bonds that bind you in worry, guild and anger. Free yourself and live the life that you deserve. A useful, dynamic approach to help you gain control of your emotions, your actions and ultimately your life. Larry's Review: If your tangled thinking and your befuddled emotions have your life in lock-up, Daniel Rutley's experienced counsel in "Entrapment" will help banish self-doubt, rejuvenate your energy level, unshackle your enthusiasm and guide you to achievable, long lasting results and a joy that is unconfined. Betrayal of the Child: A Father's Guide to Family Courts, Divorce, Custody and Children's Rights - Stewart Rein - The truth about divorce, custody and children's rights. Involved in children's human rights issues since 1989, the author concludes that only two parents can serve the best interest of the children. Larry's Review: A daring and audacious dissertation that delves into the issues of children's rights from a fathers point of view. Having experienced custodial conflict, Stewart's insightful and compassionate perspective captures the essence of what it means to be a father who loves and is devoted to his children and is willing to do whatever it takes to stay involved in their lives. Recommended. The I of the Storm: Embracing Conflict, Creating Peace - Gary Simmons - In this book you will learn to go beyond merely managing the conflict in your life to actually embracing the conflict, allowing it to teach you what you otherwise might not learn. Simmons integrates spiritual principles, martial arts philosophy (he's a 4th-degree black belt in tae kwon do) as well as the quantum theory from modern science. Larry's Review: "The I of the Storm" is an incredible resource of thought-provoking gems of wisdom beginning with page one! Make friends with this divinely inspired book. It will profoundly move you in the direction of peace and Love. Also check out Gary's Embrace Tiger, Return to Mountain: Spiritual Conflict Management audio cassette. Conversations with God: An Uncommon Dialogue - Neale Donald Walsch - In 1992, Neale was nearing 50 and feeling less than happy with his life - his four marriages had failed, his relationships with his kids were spotty, his health was poor, and he'd just lost his job. In frustration he dashed off an angry letter to God. As Walsch describes in the two bestselling volumes of his books, God answered back in a personable, colloquial voice. Their conversation continued for three years, as Walsch petitioned God with questions both basic (why do people suffer?) and personal (why couldn't he get ahead financially?). In 1995, Walsch published the first installment of his Q & A session with God, because he felt the material had something to offer whether readers believed the conversations took place, or not. Larry's Review: Regardless of whether you believe Neale, you must read this book for the incredible and helpful ideas it presents. Read a special statement from Neale on the occasion of the terrorist attack on America, September 11, 2001. 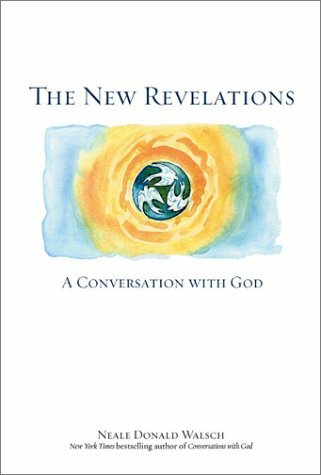 The New Revelations: A Conversation With God - Neale Donald Walsch - Like Walsch's earlier bestsellers, this New Age volume purports to be a record of a conversation with, and revelation from, God. The human race has reached a "time of choosing." This book provides us with the tools to move forward. Larry's Review: Profound, controversial and nonsectarian! Having recently had a conversation with Neale about this book, I was inspired by the wisdom this modern day spiritual messenger was willing to share. Highly recommended.